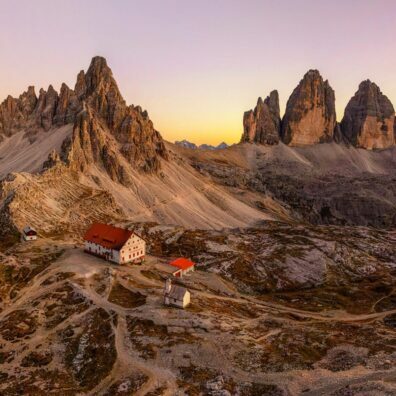 Located in Northern Italy, the Dolomites, or the ‘Pale Mountains’ as they are often referred to due to the carbonate rock dolomite, is a mountain range of unspeakable beauty, so much so, that in 2009, they were declared an UNESCO World Heritage Site. The Dolomites are one of the finest places in Europe for the landscape photographer to visit with the jewel in the crown being the Tre Cime di Laverado, a stunning eleven or so towers that make up the group but it is the main three huge monoliths and their north faces that attract interest from hikers, climbers and of course photographers. To put things into context, the smallest of the three monoliths, the Cima Piccola stands at 2,857 metres (9,373 ft) with the largest Cima Grande peaking at 2,999 metres (9,839 ft). This is a seriously impressive landscape on a gigantic scale. But there is more to the Dolomites than the Laverado. There are lakes and plenty of them which offer the landscape photographer untold opportunities to capture reflections of the mountainous peaks in the calm waters. There are mountain passes affording awe-inspiring views of the valleys below and Alpe di Siusi, the largest high-altitude alpine meadow in Europe complete with gondolas that whisk you up high to allow you to see the landscape from an elevated position. Spanning an area of 56 square kilometres, Alpe di Siusi sits between 1680 and 2350 metres above sea level and it encompasses stunning rolling fields with rustic barns, small ponds and babbling streams. If there is a more idyllic place in Europe in the autumn, I want to see it. Come and visit the Dolomites with me during the changing of the autumn colours and experience one of the finest places for landscape photography in Europe.